AAA Certified by the National Association for Information Destruction, Adirondack Mobile Shredding provides secure onsite hard drive destruction services for the protection of sensitive digital data. Adirondack Mobile Shredding, will destroy the hard drive, track and record the serial numbers and either recycle or give back the destroyed unit. 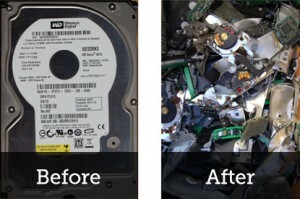 Our hard drive destruction service completely destroys the hard drive making it impossible for anyone to recover confidential or sensitive information. Adirondack Mobile Shredding provides peace of mind knowing that your sensitive data is handled and destroyed securely. Whether you’re located in Albany, Saratoga Springs, Glens Falls, Queensbury, Saranac Lake, Lake Placid, Middlebury VT, or elsewhere in Northeastern New York or the state of Vermont, Adirondack Mobile Shredding offers convenient and secure onsite hard drive destruction services. All hard drives are shredded onsite, one at a time, to guarantee complete destruction as well as maintain confidentiality and integrity.